posted by Lisa Ace in Stretch Your Soul This Lent, Batavia First Presbyterian, yoga, health, fitness, lent. posted by Howard B. Owens in flu, news, health, UMMC. Please do not visit a patient if you feel you are ill, including sore throat, fever, runny nose, coughing, sneezing or other flu-like symptoms - even if you have been vaccinated against the flu. NOTE: The Batavian spoke briefly with Paul Pettit, county health director, and he said flu reports this season are above average -- about 40 cases -- but well below the 200 or so that were reported by this time last year. posted by Billie Owens in Cornell Cooperative Extension, ticks, lyme disease, news, health. Cornell Cooperative extensions of Chautauqua and Erie counties are leading a regional initiative to increase awareness of tick-borne diseases and tick management in the Western New York Region. There will be several opportunities to participate in the WNY Tick Awareness Forum. Lyme disease and several other devastating tick-borne diseases are on the rise in New York due to an increase in the prevalence of ticks and human and tick encounters. Governor Cuomo and the State Legislature have deemed Lyme and other tick-borne diseases a public health priority and are working to raise awareness about ticks, tick avoidance and management. Please consider joining us at either of our regional forums, featuring a presentation from Lynn Braband of NYSIPM, health department officials, and a panel of community leaders. There are multiple ways to participate. The two main live events will be held in Erie County and Chautauqua County. There will also be satellite locations viewing the event via a live stream in Genesee, Orleans and Wyoming counties. Register for the live events online by visiting www.cce.cornell.edu/chautauqua. Contact the local Cooperative Extension office to register for the live stream event. The fee to participate in a live stream event is $5/person. Genesee County: Satellite viewing on Jan. 24, 4 – 6 p.m., at CCE Genesee, 420 E. Main St., Batavia. Contact Jan Beglinger at 585-343-3040, ext. 132, or [email protected]. Register by Jan. 17 to get a tick removal kit. Erie County: Live event on Jan. 24, 4 – 6 p.m., at West Seneca Community Center, 1300 Union Road, West Seneca. Contact Sharon Bachman, CCE Erie County, at [email protected] or 716-652-5400, ext.150. Register by Jan. 17 to get a tick removal kit. Wyoming County: Satellite viewing on Jan. 24, 4 – 6 p.m. at the Wyoming County Agriculture and Business Center, 36 Center St., Warsaw. Contact Don Gasiewicz at 585 786 2251 [email protected]. Register by Jan. 17 to get a tick removal kit. Chautauqua County: Live event on Feb. 16, 1 – 3 p.m., at the Frank W Bratt Agricultural Center, 3542 Turner Road, Jamestown. Contact Katelyn Walley-Stoll, CCE-Chautauqua County, at [email protected] or 716-664-9502, ext. 202. Register by Feb. 8 to get a tick removal kit. Orleans County: Satellite viewing on Feb. 16, 1 – 3 p.m., at the Cornell Cooperative Extension of Orleans County (Trolley Building), 12690 State Route 31, Albion. Contact Katie Oakes at 585-798-4265 or [email protected]. Register by Feb. 8 to get a tick removal kit. Attendees who register for one of these events, at least one week in advance, will receive a FREE tick removal kit. There will also be an opportunity to participate in a question-and-answer session. This event is brought to you by the New York State IPM Program and Cornell Cooperative extensions of Chautauqua, Erie, Orleans, Genesee, Wyoming and Cattaraugus counties. posted by Billie Owens in Blue Pearl Yoga, wellness, Ayurveda, health, batavia, news. "Holistic Wellness through Ayurveda: Intro to Yoga's Sister Science" will be taught by K. Sonam Targee of Ancient Universal Medicine from 1:30 to 4:30 p.m. on Saturday, Oct. 13, at Blue Pearl Yoga in Downtown Batavia. Have you heard about Ayurveda but don't quite know where to start? Are you interested in learning more about the body’s natural rhythms and how you can use the five elements to bring balance to the body mind, and spirit? Did you know that simple dietary and lifestyle adjustments can have a dramatic impact on your physical, mental and emotional well-being? Not sure how to detect an imbalace in the body? If you answered yes or maybe to any of the questions above, then this course is for you. In this introductory class, we will focus on making the information immediately useful and easy to understand with practical applications. Ayurvedic theory is explained, including the three Doshas, the five elements (earth, water, fire, air, ether), and the viewpoint of Ayurveda in anatomy, subtle anatomy and physiology. Diagnosis and treatment strategies will be discussed including herbal medicines and dietetics. The information is for anyone who has an interest in self-healing and wellness, or would like to simply understand the basics of this ancient Indian modality. Lastly, this class will discuss Prana and how this energy moves in the body and mind. Acknowledging that there is an inner vitality circulating throughout the body is a profound gift from Asian medicine to the world. Learning how to consciously work with it is a tremendous advantage for living a healthy life. Imagine having great mental clarity, emotional stability, and peace of mind and heart. Includes yogasanas and pranayama where applicable. Blue Pearl Yoga is located in the Masonic Temple building atop Charles Mens Shop at Main and Center streets. K. Sonam Targee is a professional complementary medicine practitioner with more than three decades of experience counseling thousands of people in the art of gaining the knowledge necessary to improve their health. Sonam endeavors to help the individual do what works for them, given the wide array of therapeutic modalities in Ayurveda and Chinese medicine. 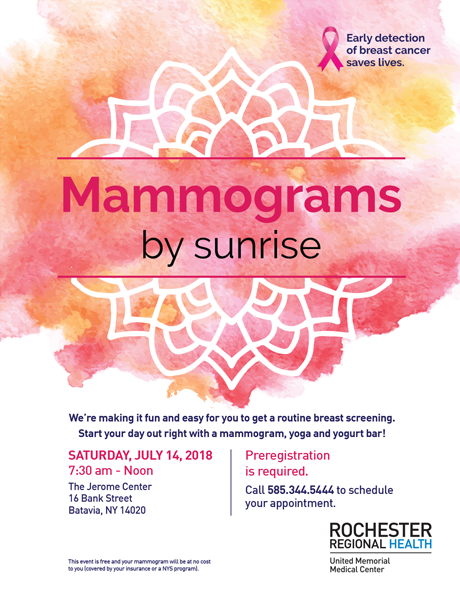 posted by Lisa Ace in Sponsored Post, advertisement, Rochester Regional Health, Mammograms, women's health, health, Services, batavia..
posted by Lisa Ace in Sponsored Post, advertisement, Rochester Regional Health, Mammograms, women's health, health, Services, batavia. posted by Howard B. Owens in Le Roy, measles, news, notify, health. The New York State Department of Health announced today that an international traveler from Europe who has been confirmed to have measles visited multiple venues in New York State potentially exposing others to measles on April 30th, May 1st and May 2nd. Exit 5 on Interstate 390 in Dansville, on May 2nd between 9:30 a.m. and noon. Individuals are considered protected or immune to measles if they were born before 1957, have received two doses of measles, mumps, rubella (MMR) vaccine, have had measles disease, or have a lab test confirming immunity. Individuals who are not immune to measles and were exposed are at risk for developing measles. The risk of developing measles is low for people who have been vaccinated or are immune. Measles is a highly contagious respiratory disease caused by a virus that is spread by direct contact with nasal or throat secretions of infected people. People first develop a fever, then may have a cough, runny nose and watery eyes, followed by appearance of the rash. People are considered infectious from four days before to four days after the appearance of the rash. The single best way to prevent measles is to be vaccinated. Individuals should receive two doses of MMR vaccine to be fully protected. If a person is unsure if they are immune they should contact their healthcare provider. Typically, the first dose of MMR vaccine should be given at 12-15 months of age and the second dose should be given at 4 to 6 years of age (age of school entry), although individuals may also be vaccinated later in life. In New York State, measles immunization is required of children enrolled in schools, daycare, and prekindergarten. Since August 1990, college students have also been required to demonstrate immunity against measles. posted by Howard B. Owens in UMMC, Wound Care and Hyperbaric Medicine Center, health, news, business. 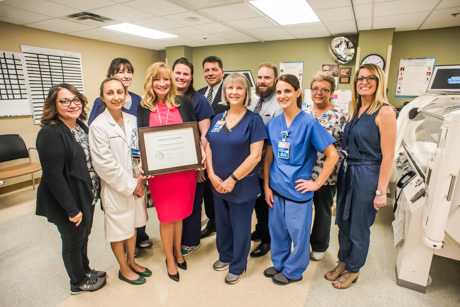 The second consecutive year, the team in the Wound Care and Hyperbaric Medicine Center at UMMC received the Robert A. Warriner III, M.D., Center of Excellence Award. UMMC achieved patient satisfaction rates of higher than 92 percent and a healing rate of at least 91 percent in less than 30 median days to heal. The award was presented by Healogics, the nation's largest provider of advanced wound care services. Pictured are: Emily Casaceli, Dr. Samar Alami, Lisa Albanese, Monika Ghise, Alicia Ryan and Holly Siverling in the first row. In the back, Alecia Grandy, Teresa Conti, Dr. Joseph Canzoneri, Dr. John Wickett and Sharon Grimes. posted by Billie Owens in CDSM, chronic disease self management, health, news, batavia. Genesee County Office for the Aging and Independent Living of the Genesee Region (ILGR) will be holding a FREE six-week Chronic Disease Self-Management (CDSM) workshop for the community, beginning on Friday, May 11. Those who attend the CDSM workshops will be shown practical steps to gain control of their daily health concerns. Participants will learn about healthy eating, problem-solving, action plans, medications, weight management, physical activity, sleep, and relationship communication skills. The workshop information is relevant for those experiencing chronic conditions such as: arthritis, asthma, chronic obstructive pulmonary disorder (COPD), cystic fibrosis, diabetes, and eating disorders. The workshop is taking place at 2 Bank St., Batavia, at the Genesee County Office for the Aging, from 9:30 AM to noon over six Friday’s; the dates are May 11, May 18, May 25, June 1, June 8 and June 15th. Participants who complete the series will receive free materials and a gift card. Preregistration by Wednesday, May 9, is required. You can receive more information, and sign up for the workshop by contacting Donna Becker at (585) 815-8501, ext. 411.
posted by Billie Owens in news, lead paint, lead poisoning, county health department, Announcements, health. Spring is here, and although many of us are anticipating the arrival of the warm weather, home renovations will soon begin. A fresh coat of paint can spruce up and room and give it new life. Many folks are anxious to begin their renovations, but it is crucial to keep in mind the age of your home. If your home was built before 1978, you must consider that the paint in your home could contain lead, and you will have to plan any home renovation, repair, and painting activity with that in mind. Lead is a metal that can harm children and adults when it gets into their bodies. Lead poisoning is caused by swallowing or breathing in sources of lead. The most common source of lead poisoning comes from lead dust which is created from chipping, peeling, or deteriorated lead based paint. The smallest particles of lead dust cannot be seen but they can easily enter and harm the body. Sarah Balduf, Environmental Health director of Genesee and Orleans counties, explains why renovating older homes could turn problematic if not completed properly. “The greatest risk with renovating older homes is that many people are unaware that their home contains lead based paint because they have completed renovations since the 1970s," she said. "Even if the lead based paint has been covered with new paint or another covering, cracked or chipped painted surfaces can expose the lead based paint, creating a lead hazard. The damaging health effects of lead poisoning are particularly concerning to young children and pregnant women. When lead gets into their bodies, it is distributed to the brain, liver, kidney and bones. Brenden Bedard, director of Community Health Services of Genesee and Orleans counties, further explains the complications associated with lead poisoning. “Children who ingest lead are at risk for developing learning disabilities, behavioral issues, developmental delays, extreme lethargy, and chronic medical complications," he said. "Pregnant women who are exposed to lead can transfer the lead to their fetus. Although the negative health consequences of lead poisoning are scary, lead poisoning is 100-percent preventable! Renovating older homes require more work and safeguards to ensure the work being completed is done safely. Remove all furnishings, rugs, etc. before beginning your project. The work area should be sealed with plastic and taped down to keep the lead dust in. Cover air vents and turn off heaters and air-conditioning systems during renovation and remodeling. When beginning the renovation it is important to have the proper protective equipment on hand. It is best to wear a properly fitted respirator with special lead HEPA (high efficiency particulate air) filters, as well as coveralls, goggles and gloves. Consider using special paints called encapsulants that seal the lead paint to the surface so it will not chip off. Use low dust practices by spraying water on surfaces before sanding or scraping. Vacuum any lead dust with a HEPA vacuum. Floors should be wet mopped with a removable mop head and then HEPA vacuumed. When finished, the mop head should be disposed or washed separately. Keep all non-workers, especially children, pregnant women, and pets outside of the work area until cleanup is completed. After the project site has been completely cleaned, throw away your protective gear or wash it separately. For more information on how to renovate right, please visit this government website.